CITE AS: John Layt, "Apps & Plugins : project rationale," in 100 Minories, March 16, 2015, https://100minories.lparchaeology.com/apps-plugins-project-rationale/ [Date Accessed: April 23, 2019]. Presenting ‘Ethos and Aims’ of Symposium project at CAA UK. Modern archaeology generates a lot of data in both physical and digital formats and this needs to be managed, integrated and analysed to enable a proper interpretation of the site to be made. 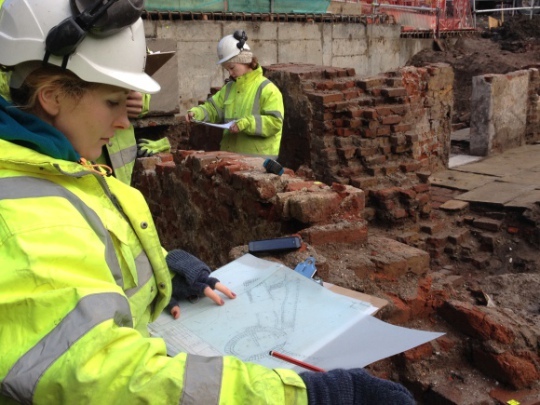 On the 100 Minories project we are continuing to develop an integrated digital workflow for the Single Context Recording system which will be released under open licences for anyone to use. Historically, archaeological data management has been done using closed computer systems. This leads to wasted effort when many very similar systems are implemented and maintained by many different parties. By developing open systems and software that anyone is free to use and help maintain, less effort is required overall and better quality software can be produced. 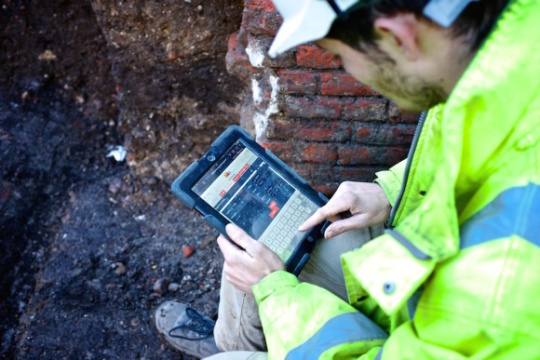 L – P : Archaeology has developed ARK, the Archaeological Recording Kit [http://ark.lparchaeology.com/] a web-based ‘toolkit’ for the management of archaeological data. Our field staff use a hybrid model of digital context registers (the ARK) and digital photography with paper recording sheets for recording contexts and permatrace for drawing context plans and sections. This analogue data needs to be digitised and integrated with the digital data in the project database and GIS. Whenever field staff need to register a new feature recorded or a new sample or photograph taken, they use a tablet or mobile phone to connect to our ARK online database. ARK records some basic details and issues a new reference ID. The field staff then record the feature on printed context sheets, and draw plans on permatrace. 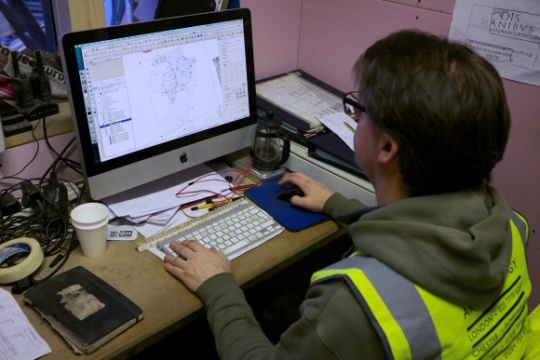 The digital data officer then scans the drawn plans and traces them using the project GIS. Digitising plans into 100 Minories QGIS. This makes the drawn plans available to be viewed, queried and analysed digitally. In the past we have used closed proprietary products for this purpose, but this does not meet L – P’s ethos of using open systems where-ever possible. For 100 Minories we have chosen to instead use the Open Source application QGIS [http://www.qgis.org/] for our GIS platform, but QGIS does not have some of the features we would like to make the digitising and analysis process quick and easy. We are developing a set of software tools to assist with the process which we will release as Open Source [http://en.wikipedia.org/wiki/Open_source]. A paper about the project was presented at the Computer Applications in Archaeology (CAA) UK conference held on 6-7 March 2015 at the University of Bradford. Click here to watch a video of the talk. The developed software will soon be ready for release to the public. Click here to read a summary of the software and its current status. 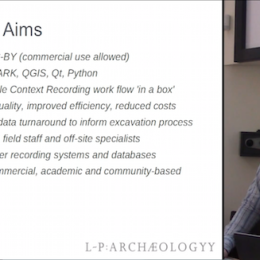 Screenshot of John Layt, L – P : Archaeology talk at CAA UK. Accessible from https://www.youtube.com/watch?v=Bb7ZPjMkuHs . ‘Standards’, by XKCD: available here http://xkcd.com/927/ under non-commercial creative commons licence.